During the 1840’s, the Australian colonists had accepted the continuous shipments of convicts to their shores with increasing reluctance so that the British Government began to look around for an alternative place to which the convicts could be sent. In November 1848, Sir Harry Smith informed the Legislative Council that the Cape had been declared a penal settlement. As soon as the news was made public a wave of extreme indignation and resentment swept the Colony. Several mass protest meetings were held and the Governor was inundated with petitions from urban and rural citizens, both English- and Dutch-speaking, who regarded the situation with horror. At a public meeting, chaired by John Bardwell Ebden in the Commercial Exchange Hall on the 18th of that month, it was resolved to send a memorial to the British Government stating the colonists’ opposition to the measure in the strongest possible terms. At the same time the Governor sent an urgent despatch to the Secretary of State informing him of the violent reaction of the overwhelming majority of the people here. In April 1849, news was received that Earl Grey had ordered the despatch of the convict ship Neptune to the Colony. On the 5th of April amass meeting of 5,000 formed the Anti-Convict League which was headed by JohnBardwell Ebden, Hamilton Ross, Hercules C. Jarvis, H. E. Rutherford and Dr. James Adamson. 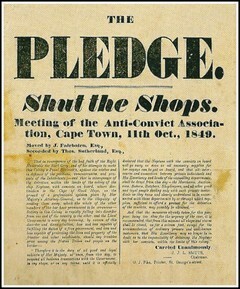 A vigorous campaign was launched to secure signatures to a pledge to boycott all that had dealings with any convicts who might be landed. Practically everyone in the Colony signed and the League, while the handful who had not signed the petition found that shops would not serve them and they could buy no foodstuffs anywhere. On the 4th of July another mass meeting, this one attended by 7,000 people, was held in front of the Commercial Exchange Building on the Heerengracht. Meanwhile, petitions continued to flow in to the harassed Governor who realised that violence would ensue if the convicts were landed. On the 19th of September the Neptune anchored in Simon’s Bay and at daybreak the next morning the Board of Commissioners and Ward masters ordered the bell of the Old Town House tolled every half minute for as long as she remained there. Despatches between Sir Harry Smith and Earl Grey now took on a note of urgency. The Governor, convinced that any attempt to land the convicts would drive the colonists to open rebellion, urged the latter to reverse his decision. In Parliament, the Secretary of State was severely criticised by C. B. Adderley, member for North Stafford and later Lord Norton, who was an unremitting champion of the colonists’ cause. On the 21st of February 1850, news was received that Earl Grey had revoked his previous decision whereupon the Neptune sailed for Tasmania leaving much bitterness against Britain behind her. Bells were now rung triumphantly and the proposal of Mr. Jarvis that the Heerengracht henceforward should be called Adderley Street was carried and put into effect. 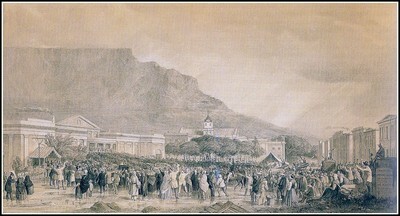 From 1846 onwards various factors produced a more sympathetic British attitude towards self-government and Sir Harry Smith was asked for a report on self-government at the Cape Colony. A draft, for the formation of a Parliament, which had been sent to Westminster, was returned with the approval of the Privy Council.